Alisa Tiwari, a participant in Yale's San Francisco Affirmative Litigation Project, said she first became interested in taking court action after reading last December that the U.S. Department of Justice, under Attorney General Jeff Sessions’ direction, had repealed guidance calling for more compassionate and less stringent treatment of poor, young and disabled Americans, as well as people of color. 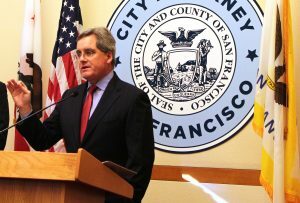 San Francisco City Attorney Dennis Herrera at a press conference. A first-year Yale Law School student’s proposal to sue the nation’s attorney general over standards for the treatment of poor and disabled Americans quickly moved from classroom to courtroom last month, earning praise from observers on two coasts. The Connecticut Supreme Court has a full docket—at least 20 cases—for its February session, weighing criminal matters and First Amendment questions, among other issues. Would the justices clear their court chamber like the D.C. Circuit did, and leave the public and press outside, scratching their heads?